rac-ism: a belief that race is the primary determinant of human traits and capacities and that racial differences produce an inherent superiority of a particular race. People protesting about government spending does not necessarily fit this definition. At best there is a subset of the groups that she describes that adopt the belief that by virtue of being white they are superior. This is a basic logic flaw on her part. But I am not going to get into that. We establish that the premise is not true. So lets break down what is REALLY going on here. To understand what is going on you first have to understand how manipulation works. Manipulation is very simple. To manipulate someone you simply need to threaten someone with a feeling that they are unwilling to feel. This is the basis for ALL manipulation. We all engage in this activity both consciously and unconsciously pretty much on a daily basis. As an example I want you to think of a time you were at the checkout at Stop-n-Stop and they are collecting for the Jimmy fund. There are pictures of kids with bald heads, presumably cancer patients looking kinda sad in a hospital. You look up at that, and then the checkout clerk says “would you like to donate a dollar to the Jimmy fund today?” At this moment you are threatened with the experience of feeling guilt. Most people are unwilling to experience guilt and many people respond by giving the dollar. Phew, feeling of guilt averted!! You may also choose not to give and fully experience the guilt, or you can choose to not give and push that feeling away. If a person is willing to fully experience the feeling (in this case guilt) it is not possible to manipulate them. The person may still give the dollar, but not avert the guilty feeling, but out of some altruistic feeling that they have. Over the last 30+ years there has been a social movement towards political correctness in this country. Much of this has been very very positive and makes our world a better place to live in. Along with this political correctness a stigma has been attached to racism where those who engage in racism have become the lowest life forms in our society. This is probably an appropriate place for racists in our social hierarchy. Along with this stigma comes a great deal of power. If you can successfully threaten someone with feeling that they associate with being a racist you are able to manipulate them 99% of the time. You threaten them with feeling as if they are the lowest life form on the planet. This is exactly what Garofalo is doing here, this is an attempt to manipulate those who listen/watch her speak, with a feeling that nearly 100% of our society are unwilling to feel. If you can identify with any of the groups/people that she describes you are immediately threatened with these feelings on an unconscious level. When threatened with this feeling you are SUPPOSED to react emotionally, with the emotional equivalent of jamming a screwdriver in a light socket. This is how humans are wired. I guarantee that there are literally MILLIONS of people that are marginally paying attention to what is happening in the political realm. These people hear things like Garofalo’s statement, then decide that they are not willing to feel the feelings that they have associated with racism. Immediately, without evaluation they come to the conclusion that the groups that she mentions are bad. What happens next is that the emotion(bad) wires (becomes associated to) the group of people that she is talking about and the ridiculous notion that they are actually racists drops away. The person comes away with teabagger=bad. If you do not want to be vulnerable to manipulation you have to be OK with experiencing the feeling that you are being threatened with. Look, let me be clear, I am not about to tell you to be a racist. But once you are “OK” with being called a racist then you can not be manipulated. If you decided to agree with the president then you do so because you take an objective view and happen to agree, likewise if you disagree. Be ok with feeling the feelings that you have associated with being a racist and you can evaluate and decide coming from a “true” position versus a manipulated one. The next question is how do you help those millions of people that are marginally paying attention? Simple.. Copy and paste the URL from this article into an email and enlighten them. 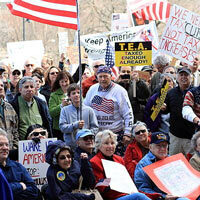 April 15, 2010 TEA Party photos - Send them in! 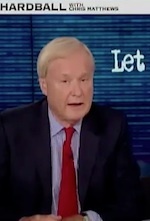 Matthews: Ya know you tea party people remind me of ... nazis? This woman is so filled with anger its unbelievable, she needs to take a chill pill! If she actually listened to the people who opposed this president's policies, she would see that a majority of the dissent are from people who actually oppose his policies and not just because he's half black. Wow! I am a racist because Garofalo says I am? Is she the new Racism Czarina? I love her "logic": Obama is (half) black. To oppose Obama's policies can only be because he is black (since they are sooooo proper and correct). You oppose Obama, therefore, you are a racist. By this train of "logic", liberals opposed President Bush because he was white. It makes just as much sense, if you can call it that. Erik is precisely correct: liberals like Garofalo, lacking any true logic, love to put their debate opponents on the defensive by accusing them of being racists, homophobes, bigots, haters etc. It is the last defense of those losing an argument due to lack of facts. It is a form of manipulation used by the weak minded. When conservatives dissent, it is called "hate" by the liberals. When liberals hate, it is called "dissent". For her to say that Republicans are "carrying the water for racists since the 50's" is so far fetched that she should turn in her degree in history and "American studies". She obviously learned little, or was taught poorly. I wonder if she knows who Robert Byrd is? I wonder how she feels about former House Speaker Thomas Finneran, a Democrat, who was sued by blacks in his highly gerrymandered district for manipulating his district to take their representation away? I wonder how she explains why blacks, after decades of affirmative action and Democrat representation, are no better off than they ever were? Why is a stand up comic considered an expert on anything other than comedy, particularly when she proves that she isn't an expert every time she opens her mouth? Finneran was House Speaker in Massachusetts, by the way….